By now there will not be many people who do not know that the decision of the ICTY appeals chamber to release Ante Gotovina and Mladen Markač inspired a lot of passionate responses. We have not heard about those responses in too much detail because pretty much everybody who responded did so in exactly the way that could have been predicted before the event. There was no statement from a public figure that would have caused you to raise an eyebrow and say, “this person associated with promoting the regimes of the 1990s has really shocked me with extraordinary intelligence, depth and sensitivity!” or “this person representing a political party heavily engaged with paramilitary activity and propagating ethnic hatred has emerged as a paragon of understanding and caring.” But then you didn’t expect that. What we did get was fairly telling, though, to the degree that responses to events allow us to generate a picture of public opinion and sentiment, and mark a moment in the development of ways in which people understand the recent past and perceive one another. It might be possible to say that this moment is an important one because it includes a generation of folks who do not have direct experience or memory of the period in question, but who were largely educated with some fascinating and self-serving versions of it. The typology of responses presented below can hardly be taken as exhaustive. More categories could certainly be added, but I have tried to keep it short for the sake of readability, and I think what is down here accounts for most of what is out there. You could think of it as a way of using public readings of the past to get an overview of what people expect and think in the present. I’ve divided the responses into three general types with three subtypes of each. Triumphalism and ethnoeroticism: There was so much of this and it was so dominant that it is hardly worth describing in detail. So let’s do it with a picture, from the moment when the released defendants’ plane landed and the traffic controllers told them over the radio, “Our dear generals! The Croatian Air Traffic Control Authority is proud to greet you and wish you welcome into the Croatian airspace, for which you fought and sacrificed yourselves. From the bottom of our hearts, thank you for that.” Not to be outdone by sacrifices for air, the airport firetrucks assumed a pose that would have done a pornographic film director proud (naturally we needed the salacious backstory as well). New institutionalism: The ICTY, dismissed as a political institution directed against [insert nationality here] until about 9:30 AM on Friday, was magically transformed into the cleanser of historical legacies. Hindsighted over-shoulder backslapping aside, this was not the expected outcome. While many domestic politicians and parapoliticians leapt at the chance to make the point that all responsibility had been erased, it got a surprisingly strong endorsement from Ian Traynor in the Guardian (of all papers! ), who found that the Tudjman regime “is exonerated.” Predictably the discussions quickly shifted from an assertion of wounded innocence in 1995 to an assertion of wounded innocence across the boundaries of time and space. A look at the dispiriting comments on Traynor’s article shows enthused readers opining on whose crimes were the worst in the whole 1990s war period, how many people were killed at Jasenovac (stop the presses! not as many as some people wanted! ), the ethnic coordinates of Communism, and the injustices of the Austro-Hungarian empire. The discussion offers a reminder about instrumental interpretation and the very popular refusal to take history seriously, as if this was needed. And it reminds us that views of whether institutions are good or bad all too frequently put a cui in front of the bono. 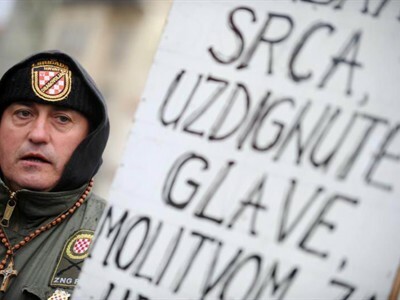 Finding the most opportune posture: Released defendant Mladen Markač found his moment, he returned to Croatia and the next day was at the head of a parade commemorating the destruction of Vukovar. Ivan Čermak, acquitted by the Tribunal in the first instance because it could not be proved that his military rank brought him a job to go with his uniform, was out and about to seek an advantage too. There were some other people who also saw their chance to make hay while the national euphoria shined – most impressive of all of them was the coach of the national football team, Igor Štimac, who invited Gotovina to give the opening kick the next time Croatia plays Serbia, because we all know that what makes Balkan football matches so dull is the complete absence of nationalist provocation. Surprisingly, the person who participated least of all in the mass invitation to escalate was Gotovina himself, who declined to glorify the war in his arrival speech, told reporters he was going on holiday rather than to veterans’ rallies, and gave a surprisingly conciliatory interview to an outré Serbian tabloid. One possible explanation: the highly reticent philosopher Žarko Puhosvki thinks that Gotovina is preparing himself for a political career, and in that case it is best to move the Etch-a-Sketch to the centre. Refueling 1991: The year 1991 was bad one for the Bordeaux harvest and for people, but if you were an aspiring paramilitarian or a national demagogue in the Balkans, it was great. That year saw the emergence of most of the extremists who would be accused of crimes in the years to come, and in Croatia, the incidents that would lead to most of the bitter resentments that mark nationalist politics today – among them the destruction of Vukovar, which was commemorated over the weekend following the appeal verdict. If the heroes of 1991 had their day in the sun in Croatia on Friday, in Serbia they have been out of fashion for years (the fact that one of their successors is currently president and another is prime minister owes a lot to some humiliating but ineffective ceremonies of public repudiation of their political history). But always ready to celebrate crime, and sometimes commit it, the Serbian Radical Party – their president is waiting for an ICTY verdict himself – saw its moment. They organized a poorly attended public protest (their last one had almost as many participants as police, and ended with 179 arrests) of the appeals verdict, and for good measure they burned a Croatian flag. No doubt they were grateful for the opportunity to be burning things again. Tuquoquism: Oluja was okay because Vukovar and Srebrenica were really bad. The people charged in this case (and especially the people whose orders they carried out) were innocent because their war opponents were a lot more guilty. Every crime is justified by another crime. Heard these arguments before? Courts reject them and give them a label: tu quoque (in Latin this means “so’s your mother”). The reason courts reject them is that their job is only to weigh the facts that are under consideration, not some real or potential other case. That is a decent principle in everyday morality too, enshrined in too many proverbs and folk sayings to name. In politics, though, and especially in the amateur discussions that spring up around politics, people do love themselves some tu quoque. Why didn’t the trial chamber mention Vukovar? Hint: it wasn’t in the indictment. But never mind, the lack of a conviction for one crime means there should be no convictions for any others. Sounds so right, and yet so wrong. Reductio ab nacošem: Fitting the news into national categories was easy! For SETimes, “Croatia celebrates” and “Serbia [is] stunned.” Over in the world of France24, “Croats rejoice while Serbs fume.” So in the eyes of the headline writers, the (only) people who responded to the event were (all, undifferentiated) Croats and (all, undifferentiated) Serbs. How is it possible to account for the fact that there are Croats and Serbs who did not share in the euphoria/outrage and who think for themselves? Once the headline collectivization has been performed, the only possible explanation has to be that they are in some unexplainable respect not Croats or Serbs (the fact that there are people in the world who take an interest in events but are yet neither Croats nor Serbs may prove more resistant to popular-media explanation). That this perception should appear plausible at all is a consequence of the success of nationalist politicians in making it appear that the least tolerant people in the population speak for the entire nation – or to paraphrase my colleague Chip Gagnon, to make the consequences of violence appear as though they are the causes. The people who do the dirty work know that they are not representative, of course, which explains the enthusiasm of Gotovina’s and Markač’s brother against the unarmed, Veselin Šljivančanin. Maintaining a disrespectful silence: Some of the people you might expect to chart a course of understanding avoiding the extremes have said – nothing. This derives largely from a sense that the thrilled and the outraged will have their day and take up all the space that is available for communication. What is soothing about this? It contains an implicit promise that the fireworks will fizzle out and the reasonable folk will be back. It would be more soothing to be certain that they really will be, of course. Silvering the lining: Opposing the “new institutionalism” position which contends that all historical responsibility has been abolished is the official line taken by a number of high-ranking officials of the Republic of Croatia. President Ivo Josipović affirmed an ongoing obligation of the state to try and punish crimes. Prime minister Zoran Milanović promised that Croatia would “fulfill its debt to people who were wronged.” Foreign minister Vesna Pusić promised “no amnesty” for war crimes. This was the moderate official line, according to which there were crimes that domestic prosecution is obligated to address, and will, but that the two people charged were not the people responsible for them. This was not, however, the line endorsed by the majority of the ICTY appeals chamber, which dismissed evidence related to the planning and organisation of crimes. As Drago Hedl points out, whatever intentions about domestic law enforcement are expressed on high, the record is thin, the will is weak, and the probability is low. Rara avis – a concern for the victims: The Youth Initiative for Human Rights pointed to the number of victims of unpunished crimes and the systematic character of the crimes and insisted that the Tribunal’s verdict did not eliminate the need to address unmet demands. The Humanitarian Law Centre predicted that as a result of the verdict “nobody will hold it against Croatia anymore” if crimes are never prosecuted. Women in Black promised autonomous answers to the problem that “the suffering of victims and survivors is clearly unimportant to institutions, just like ordinary people are unimportant to them, and because of that they replace justice with political games.” And Documenta warned of the deep social consequences of a “tragedy with no epilogue.” To the degree that there will be people effectively working to demand responses, and not depending on ICTY to deliver them, there is some chance that last Friday’s verdict will not be the last that is heard of the story. What to make of the array of responses? Still they indicate a problem raised but not addressed. But it should not be surprising that the story does not end with a flag-waving whimper. No court has ever done for a society what people in the society were not prepared to do for themselves. As much as politicians have shown that they are happy to make use of contested memories of the wars of the 1990s, the responses mostly tend to indicate that public memory is not a political issue but still a prepolitical one, in which identities remain heavily invested in a small number of prefabricated articulations. The most vaspitani of the responses have taken the form of vague invitations to turn toward the future. The people making this invitation cannot predict the future of course, just like nobody else can. But the probability is always very high that if nobody does anything, the future will be a lot like the past. Tags: crimes, Croatia, Gotovina, ICTY, media. Bookmark the permalink. Previous post ← Today is a good day to be a criminal. This is one of the best things I’ve read on this case, Eric. Enjoyed your various comments. Yes, Balkan football matches are indeed so dull.